← Only 3 weeks away – Gledhill’s 80’s Dance Party! There will be an opportunity for students to skate on the ice before the game starts. If you wish to participate, please arrive at 12:30 to lace up. The pre-game skate starts at 1pm. *TICKETS can be picked up in the office the week of November 27th 2017. 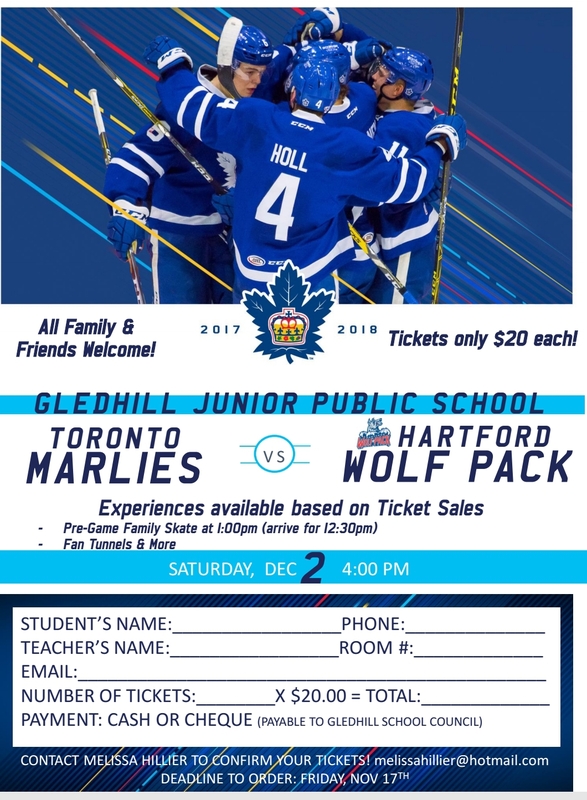 If you choose to have your child pick up the tickets, Marlies will not be issuing replacement tickets if tickets are lost. *TICKETS must be picked up by Wednesday, November 29th at 3:30pm (please note that Friday is PA day). Tickets will not be handed out on game day.